Mountain Thunder Lodge is a highly-sought after rental location. It is a luxury, first-class retreat; situated in a quiet, beautifully wooded community. 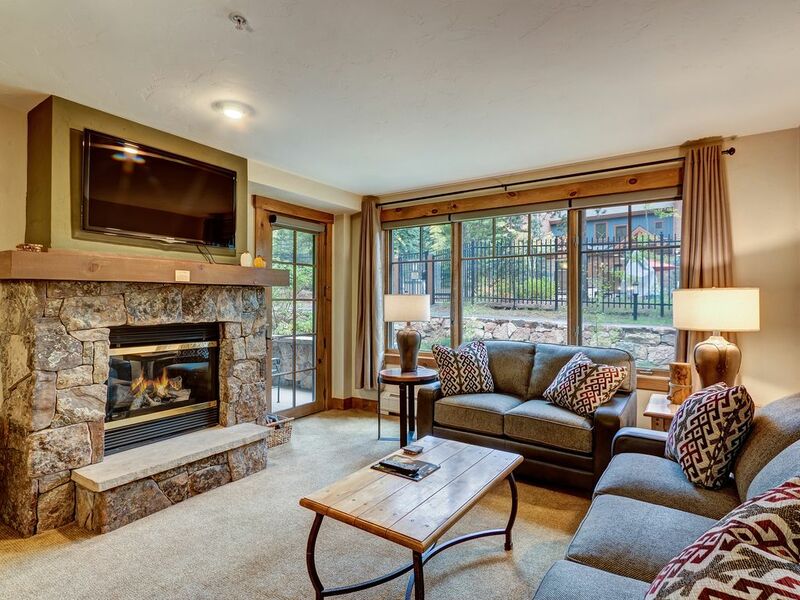 Nestled perfectly amongst pine and aspen trees, guests visiting will find themselves surprisingly located in the heart of historic downtown Breckenridge; just 2 blocks from Main Street and 1/4 mile from the Breck Connect Gondola offering direct service to Peaks 7 & 8 of the Breckenridge Ski Resort. Not to mention, nearby ski-in access! We enjoyed every moment here in Breck. We settled in and made this space our home for a week. We did not rent a car and were able to walk easily to town, to the gondola, and to City Market for groceries. We hope to be back next year! Condo was exactly as pictured, very pretty, neat, clean. We loved that it was on the first floor, and the it had a convenient parking garage. The ski lockers were also on the first floor, but we had a little trouble accessing ours, finally (at the front desk's instruction) picking a random open locker from another condo. Easy access to gondola, and even more easy ski-in from Four o'clock run. Really, the only thing I didn't like about it (and I somehow missed this when booking) was that it didn't have a washer/dryer in the unit. There is one down the hall, but I just prefer being able to throw stuff in there and leave. Also, we never cooked in, but all kitchen equipment looked new and well-stocked. Great location, walk to town and gondola and ski in. Plus the free shuttle is a huge positive. Condo is very clean and located in a quiet wooded setting. Will be back. -easily walk to gondola and main street! To my family, this is the best property in Breckenridge! Love being able to walk everywhere from this property! Convenient to everything- Main Street shopping, restaurants, concerts, gondola!